Max Tohline came to Missouri S&T from Madeira, Ohio, in 2002 with a plan to study aerospace engineering. But an elective course in film caused his true passion to take flight. “I always had an interest in film,” says Tohline, Engl’07. So he enrolled in Study of Film, a course taught at that time by James Bogan, Curators’ Teaching Professor emeritus of art history and film. 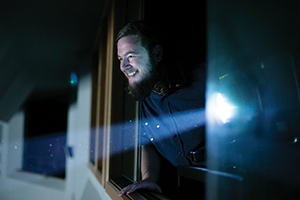 “Jim took this little spark of interest in film and turned it into a projector beam on full blast,” Tohline says. Bogan’s playful rebuke led Tohline to watch the movie again. That second screening gave Tohline a new perspective on the film. These days, Tohline is trying to help current students take a different perspective on life by having them watch and analyze movies. A lecturer in arts, languages and philosophy, he teaches the same course Bogan taught him — and countless other students for more than four decades. The course attracts a wide array of majors, as it did during Tohline’s student days. Students may enroll because of their fondness for film, but there’s more to the course than weekly movies. Tohline uses the issues raised by the films he shows as entrées into serious philosophical discussions. “In many disciplines, we are learning how to find the answers to questions that have been around for a long time,” Tohline says. “The right answer is already known. It’s in the back of the book. That brainstorming happens at the end of each Tuesday night movie. After the credits roll, Tohline and the 50 or so students enrolled in his course hang around to discuss the questions posed by that evening’s flick.